I am a huge fan of "interactive picture books" - stories that encourage kids to get involved, even if they don't know it. Coming in many forms, some employ techniques that drive the overall storyline, while others give kids a subtle nudge to respond. Whether inherent, or a bit more sneaky, these elements help readers connect with a book and prove that reading is fun! The REFOREMO Facebook Group includes various lists that can inform you further. We encourage participants to add titles to our lists as research is conducted. Cindy is giving away a picture book critique to one lucky participant. To be eligible for prizes throughout the challenge, you must comment on each post, be registered by March 4, and consistently read picture books during the challenge. I really enjoyed seeing all the ways to create an interactive experience with the readers, besides simply metafiction, that you found in mentor texts. I gained some new insight into a few books I had liked before. Thank you! So much better than iPads! Love your list for real brain-stimulating interaction. Thanks! I love how each book in your post provided a different example of how to create interactivity. So many creative possibilities to get me thinking of more! Thank you! Ah, the power of the interactive prompt in picture books! What a fantastic post, Cindy! Many thanks for sharing! I must confess I don't think I can write an interactive book, but I do like refrains and chanting. Thanks for giving us different examples of interactive writing/reading. You've given us options to explore and think about. Thank you, Cindy, for a list of mentor texts that are interactive! I must confess, i've never thought about making my text more interactive. I like the idea of refrains and chanting! Like a chorus in a song - easy to pick up. Thanks for these interactive mentor texts. It gives prereaders one more way to take part in reading the book. All of these books are diiferwnt approaches to interactivity, which I find great value in knowing now. Thank you Cindy. Many thanks Cindy! Great list! So much to learn - so little time! I DO like koala and YOU. Good choices for kid interaction. TY, Cindy! And, Ty for being the guru of ReFoReMo feel organization. We couldn't do it w/out you! Thank you for bringing these book to our attention and for your thoughts on the topic! I never had thought of some of these books as being interactive, but, of course, they are. I had always just thought of books like Press Here. Thanks. Thank you Cindy. I am particularly interested in interactive books. I was not familiar with Battle Bunny. I was intrigued by complex story written over the original in true Jon Sceiszka style! I was not familiar with I Hate Koala either but enjoyed the repetitive line and the surprise at the end. Hi Cindy, thanks for this list. I love Battle Bunny! It's so much fun. I'm not familiar with the other titles on the list and am looking forward to reading them. Thank you for these fun selections. You made this one of my favorite ReFoReMo days! 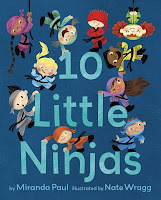 Somehow, I missed reading TEN LITTLE NINJAS. Thanks for the reminder. Hmm... I've never tried to write an interactive PB before, and have never even thought how to go about it. I'm intrigued! And yes- Battle Bunny is really smart. Not a great one to read aloud, but a great one for a kid to pour over on their own. Thanks! Looking forward to studying these books. Thank you. Kids love interactive picture books. Ahhhh...that gives me an idea for my w-i-p! I think interactive books are important for so many in the younger audience...they truly help them to "feel" the story and makes them more meaningful overall. Great list of mentor texts! Interesting post. I hadn't thought of Koala as interactive but I read it again. I loved Press Here-great book to see if they are really comprehending what they are reading-you could tell immediately by their actions. Thank you! I see the value of interactive texts increasing as kids are lured with electronics and media. Great list! Thanks! 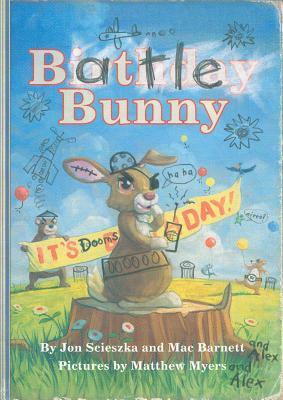 I learned after sharing BATTLE BUNNY with my grandsons, they do this with books their mom picks up at the thrift store, remaking stories of their favorite titles...who knows? Maybe a future author in training! What fun interactive recommendations. Thanks, Cindy! Great choices, Cindy. These are among my favorite PBs. I'm always so happy when I find a good interactive idea. Fun for the reader, fun to write. Thanks for sharing such fun titles! Keeping books - not iPads - in the hands of children is always a big bonus! Love these books for reading aloud! Thanks for sharing these fantastic titles! Thanks for sharing these books. My kindergartners & I like interactive books! What a great bunch of books. I loved PRESS HERE. If I were going to add to the list, it would be the book SAM’S SANDWICH! It has fun fold outs for kid to discover surprises. And the author makes good use of rhyme. Interactive books add another dimension to the reading experience for kids. Thank you for these great selections. Refrains are my favorite interactive technique! Thanks for the post. I love interactive books too! One that keeps everyone engaged and giggling is This Book Just Ate my Dog. Thanks for sharing these mentor texts, Cindy. I adore when authors think out of the box to capture the reader. Super selection of mentor texts. Thanks, Cindy! These area all great books. Thanks for the recommendations! Great list of books to read and study. Thanks for this post Cindy. Thanks for another great list.My library has gotten to know me well but my book buy list has grown as well. Lift the flap books also provide some interaction as well. Have a great day! I just read I Don't Like Koala last night! Press Here is adorable too. Thanks for the focus on the interactive, Cindy. I'm working on a puppet show right now and have been thinking a lot about ways for children to interact so I can really identify with these! Hooray for books that engage kids and make reading fun! (For adults too!) Thank you, Cindy, for your thoughts and selection of mentor books. I DO NOT LIKE KOALA is my favorite from this list! It is a great "class reader" choice. Thank you Cindy for this post full of fabulous recommendations. What a nice collection of books that are differently interactive! It’s so interesting to think of these books as a collective example. Thank you so much for reminding me to write refrains. Kids love to repeat them when you read aloud to them. Don't work as well with prose as in poetry I think. 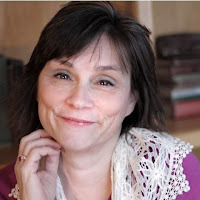 Thanks for all you do Cindy for these lists on the site. These types of books are always a big hit with my two young kids! Great recommendations, Cindy, Thank YOU. I DON'T LIKE KOALA is an all-time favorite! Such fun books to read to kids. 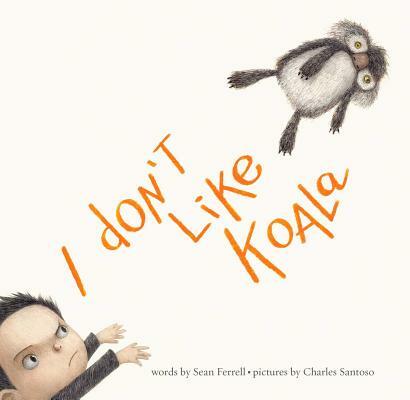 Looking forward to finding a copy of I Don't Like Koala-the one I haven't found yet! I like interactive books, too. The Pigeon series comes to mind. I enjoy interactive books! My current WIP aims to do just this so I will be studying these titles extra close. Thank you, Cindy! Kids never get old of interactive books:) Thank you Cindy for sharing these fun titles! Thank you for sharing this mentor text. Thank you, Cindy. This is a great list of interactive books! Thanks for this interactive, list. Good food for thought as to how I might try an interactive angle for some of my own MS ideas. I also love the concept of interactive books. Thank you for the great mentor book list on this topic. I love interactive books. Love Ten Little Ninjas. Thank you for your post. I love interactive picture books! I didn't even realize my newest one is interactive. In YOU KNOW WHAT? there are 14 "you know what"s in the book, and I invite my readers to help me read that part when I point at them. I've been having the sweetest shared readings. Any repeated refrain can work as well. Kids love that. Thanks for your post, Cindy! Thanks for these examples- it was fun to see different ways picture books are interactive! Thank you for sharing these great mentor texts! I adore Koala, myself. I have mixed feelings about Battle Bunny but I can't wait to see what my 7-year-old thinks of it. Thank you for sharing this with us, Cindy! Interactive books are so much fun to read to kids- and fun to write, too! Thanks for the helpful list. Interactive books are a great way to draw kids in. Thanks for these! Press Here is one of my kids' favorites! Even though they obviously know the trick, kids love "playing" this book over and over again. Ingenious. I love interactive books. Kids do too. I think it makes the sharing of the process of reading more memorable and fun. Great selection of titles that show the different ways books can be interactive . . . thank you!!! Fun selections and ideas for interactive PBs. Thanks for the post! Thanks for offering this selection. I looked at some books I already knew in a different light. I'm a fan of interactive books, too! I hadn't thought of some of these texts as interactive. Thank you for the new perspective. Thanks for these titles, Cindy! Reading these books yesterday without your commentary, I was feeling lost about how some of them fit into the category of interactive picture books. But then this morning, it was like "AHA!". Great choices to show a variety of ways that books can be interactive. Thanks! Thanks for these books Cindy. Each one is so unique, but all are interactive in different ways! Some of these I wouldn’t have described as interactive before reading this. I love your perspective on this. I love your book choices, Cindy. They're so much fun! Love interactive books! I had not seen wordless picture books considered, interactive, but it totally makes sense. My daughter likes "reading" these ones back to me. Interesting! Cindy - thanks for reminding us of ways to engage kids! Getting children involved in the story in an interactive way is a slam dunk with these. Great choices;wonderful mentor texts. Thanks,Cindy. Thanks so much for the suggestions. I'd never seen any of these before but enjoyed PRESS HERE and BATTLE BUNNY a great deal. Fun! I love it when books get kids involved in making predictions and/or chanting along. Thanks for the insightful post, Cindy! Some of my favorite picture books are those in which the kids participate in the reading. And those are the ones they always go back to when it's free choice time! Thanks for the great list of books! Kids love interactive books. Thanks for the variety of interactive books for us to study. Thanks for some new perspectives on what "interactive" can mean for a picture book. I tend to think more of books like PRESS HERE, but books with refrains and some of the other elements you mentioned obviously are too! On another note, I wanted to make you aware that your list is 33% female and 66% male while the actual demographics of the industry are about 80% female to 20% male. There have been lots of discussions in#kidlitwomen about representation this month so I wanted to mention this in case you want to make more female-friendly lists in the future. Thanks again! Thanks for sharing your interactive PB mentor texts, Cindy! I loved that you consider wordless PBs interactive! They are, of course, but I never thought of them in that way before! Now I will! Love the interaction, can't wait to read these! Thanks! Brilliant Selection of books. Battle Bunny is just too much fun. Thanks for this great selection of books. Interactive picture books have evolved into more than flip the flap books. These titles cleverly engage all kids and are excellent choices for high energy kids. I love adding interactive elements to my picture book texts and I've found that including questions in the text is a simple and effective tool for encouraging engagement. Repetition is even better. Thanks for this list of great, interactive picture books! I tend to think of interactive as a "open the flap" type of book, so I loved having my definition expanded! Thanks for these great choices. I got to hear editor Emma Ledbetter talk about the evolution of I Don't Like Koala at a conference - what a fabulous book! Thanks for this list of interactive books. They are great mentor texts and wonderful reminders of the different ways in which books can be interactive and engage children in delightful ways. 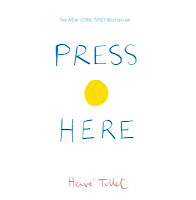 Press Here is so cleverly done! Cindy, when I taught children with special needs, I saw how much they enjoyed interactive books. These are great titles for partner reading, pairing a strong reader with a child who possibly can’t read or who is a reluctant reader. I remember the first time I read Press Here to students and saw their eyes light up as they followed the directions. I appreciate you reminding me of how much fun these types of books are for both children and adults. Thank you for introducing me to some other types of interactive books, too. Thank you for the variety of suggested books. The two standout books on this list for me are I Don't Like Koala and Battle Bunny. Each were super creative and hilarious in their own ways. The fact that the koala's name was just "Koala" was one of multiple layers of humor in this story. The illustrations of the koala were so deadpan, it made me laugh the entire time I was reading it. I loved the twist ending where the dad decides he doesn't like Koala on the last page. Battle Bunny was a sweet, innocent story that was completely hijacked by Alex who made everything "evil" and ultimately more fun and interesting for the reader. Like you said, it encourages imagination while reading (i.e. how would you write/draw this character's story differently?) It's a published version of what I'm sure many kids wish they could do to their library books - write and draw all over them. I've never seen anything done like that before, so I found it incredibly creative and something that would greatly appeal to kids too. Thanks for the wonderful selection of mentor texts. My faves were Press Here (for interaction with the book) and 10 Little Ninjas (for fun near-repetition and re-imagineering the old go to bed rhyme). Thanks for sharing them all. I love the FLORA books. So fun! All of these books were so fun! I loved seeing how the dots would "react" in Press Here. And Battle Bunny cracked me up, so creative! I'm looking forward to exploring this concept more. Thank you! These books are so much fun! I love interactive books. Thanks for a great post, Cindy! Thanks for your suggestions, Cindy. I've read them all and love them all! 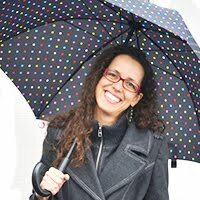 CINDY: THANK YOU for the WONDERFUL inspiration! Interactive books are a GREAT way to get kids excited about reading. These are especially needful to help lure those reluctant readers. Just tonight, I was talking to my niece about her little brother's lack of interest in books. THANK YOU for providing the book examples--I know they will inspire both me AND MY NEPHEW!!! It has been a while since I've read Press Here. It's one of those classic interactives that makes me wonder why I didn't think of that. So clever. Great inspiration, Cindy. Thank you! Thanks for the great selections. PRESS HERE is still wonderful after many readings. I love interactive books, too. They are so fun to read to a class. Now I'm inspired to try to write one! My kid loved Flora and the Flamingo! Thank you for the reading list of books that really engage the reader. I enjoyed seeing all the different techniques authors and illustrators use. 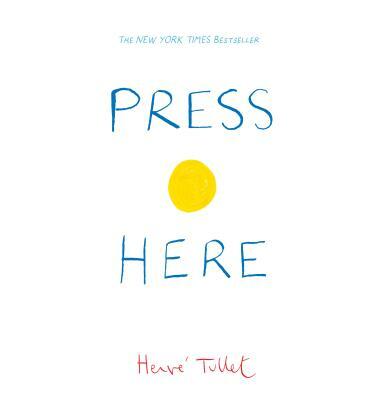 Press Here is a great book for the really young ones. Interactive books are often ones that make me say "this is genius- I'd love to have written this!" In particular, I can remember saying that, the first time I read PRESS HERE. I also really enjoyed the interactive parts of ARE WE THERE YET?, where the reader has to turn the book. How fun! They make GREAT read-alouds. I am so looking forward to reading these books. Especially Battle Bunny. Yes! I love interactive picture books too! Kids don't even realize they're reading-they're just playing! Thank you Cindy, for these great examples! On the way out the door to baby-sit my 3 (almost 4) year old nephew, I grabbed PRESS HERE and BATTLE BUNNY without reading them to myself first. He absolutely loved PRESS HERE and wanted to read it twice. He probably would have read it more than twice, but the second time around, I skipped the last line! BATTLE BUNNY was a bit too advanced for him, but he also loves TEN LITTLE NINJAS, which I bought for him last year. His parents complain that that book is too long, though. Haha! My students loved Battle Bunny. Once they got over the "Someone scribbled all over this book!, they would immediately want to jump in and interact with it. Thanks for inspiring me to look at points where I can add interaction in my own writing. Loved them all! What fun books! I love interactive books as well! I had SO MUCH FUN reading "Press Here" to the preschoolers where I teach. I'm excited to reread the books on the list because some I know but wouldn't have characterized as interactive. Thank you for the post! Love these books! My kids always get a kick out of books that encourage them to interact, even if it's just with a repeated refrain. Thanks for the great post! This kind of book is so much fun to read to kids and watch them interact. Thanks for a great list. Thank you for the great titles! Thanks. Looking forward to getting from the library. Thank you for the truly fabulous mentor text list! Children LOVE interactive books! Love this look at non-traditional interactive picture books. I had never considered books that encourage chiming in on repetition or wordless interpretation to be interactive, but they most definitely are! I DON'T LIKE KOALA is wonderful! Thank you Cindy. These are great titles to explore! You had me at Press Here! Great selection! Love interactive books! Thank you for sharing! I like how each book in this list models a different approach to interactivity. Great list! Thanks for sharing these amazing examples on how to interact with our readers! Hadn't read Press Here since it came out. Loved it then and again, today. such a fun book to share with others. I love the ways to incorporate activity into books. Thanks for sharing so many examples. I don't like koalas...I love them and interactive books! Thanks for teaching me about how books can interact with their reader. I could read Battle Bunny over and over. Not a quick read—lots of thought over the text and illustrations. I'd love to hear more from the authors about their process. My understanding of interactive was broadened with these. Thanks! I don't like Koala! is one of my new favorites! The simple but so so clever text and Santoso's expressions in the illustrations! It's a book that demands rereading. Another new interactive favorite is Escargot by Slater. I've added "interactive" to by writing goal list! I loooove I DON'T LIKE KOALA! Charles Santoso's illustrations are amazing! 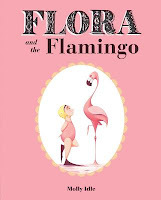 And what fun storytelling in FLORA AND FLAMINGO by Molly Idle (with fun use of flaps). I love the ilustrations in I DON"T LIKE KOALA. I never really thought of it as an interactive book, but this post has made me look at it in a different way. I'm excited to seek out more books that do the interaction a bit more subtly as I think this will help my own texts. You've broadened my definition of interactive texts. Thank you. Thank you for all the suggested reading. I remember how much I enjoyed interactive books. That was a long, long time ago. There are books that we may not realize how they can be interactive. Thanks for putting this in a broader light. I've been wanting to try writing an interactive book. Thanks for the suggestions. Thank you Cindy for recommending these books that show us how to provide integration with our text. Appreciate the offering of books that showed a variety of different ways to interact with a book. Thanks for pointing out the many different ways to encourage interaction in writing. These books are great examples. Very helpful! I'm a fan of interactive too. There's just something about listening and watching a child engage with a book! Of all, I enjoyed Tullet's book the most; so much so that I took out the companion books. The simplicity of the text reveals to us writers how difficult that probably was to create! Loved the interaction for little hands. Today's books have inspired me a lot. This topic has reawakened an idea I jotted down about two years ago! Such fun titles today. My kids love Press Here. I'm still waiting on Battle Bunny to come in but I just KNOW it's going to be a hit! Thank you Cindy!! These titles are all so engaging! Thanks for the mentor text suggestions! Love these recommendations of yours, Cindy, and I agree! Another new interactive title I adore is Dashka Slater's ESCARGOT :). This idea of "proving" that reading is fun is a good one. Especially for those reluctant readers who may just need to have a good time with a book and forget they are reading. Thank you for this list! Great books. Thanks for your post! I love how my toddler responds when we read interactive books that encourage chanting, counting, animal noises, etc. It makes story time magical for both of us. Great choices! I Do Not Like Koala is one of my favorites - creepily funny. I am always amazed when my kids participate by turning/shaking/moving/pressing parts of books. One that also comes to mind is Bunny Slopes by Claudia Rueda. And Don't Push The Button! by Bill Cotter. It's a great goal to try to amp up the interactive appeal of a WIP - thanks for these concrete examples of successful interactive books! I read I don't like Koala. It reminded me of Don't let the Pigeon Drive the Bus and Ask Me by Bernard Waber. and the best interaction - When they want to read and reread again and again. Great variety of interactive books. Anything that keeps the reader's attention and wants to actively turn the page to see what's next is a big hit. I Don't Like Koala is one of my absolute favorite books! Thank you for pointing out the ways in which the above books encourage interaction. My kids love interactive books. Thank you for the post.